Hill walking on the "edge of the world"
The Outer Hebrides are spectacular, wild and remote. You will be immersed in a landscape where turquoise seas, white sand beaches become machair (coastal pasture), and moorland gives way to mountains. Your eyes are drawn to the machair where colourful wild flowers grow and rare birdlife flourish. Spot wildlife such as otter, dolphins, whales and red deer. Other birds to be seen include raptors golden eagles and sea eagles. 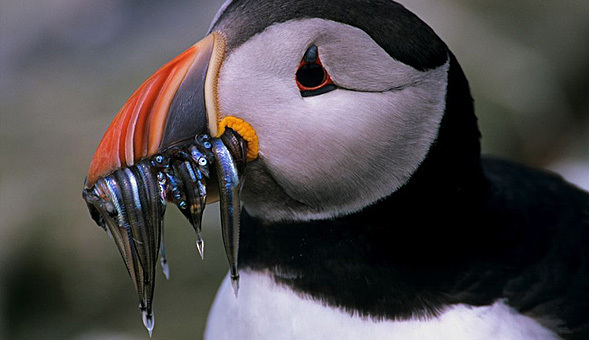 NWF offer you the opportunity to explore this unique environment with an edge of the world feel. A landscape shaped by weather and humans. Ancient monuments like the Callanish standing stones and black houses testify to humans surviving in these wild and remote islands. 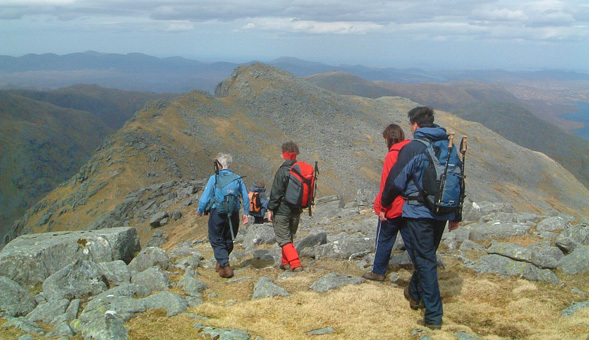 So come walk and climb the most distinctive of the Outer Hebridean peaks with NWF. The Uig Hills in west Lewis give you the most "on the edge of the world" impression of any hills in Scotland. The wild and rocky landscape of Mealisval or Griomaval gives a memorable day’s hill walking before we relax on the dramatic cliff-fringed sands of Traigh Mangersta. On North Harris we climb Clisham at 799m; you have summited the highest peak in the Outer Hebrides. Although steep we follow a path most of the way. 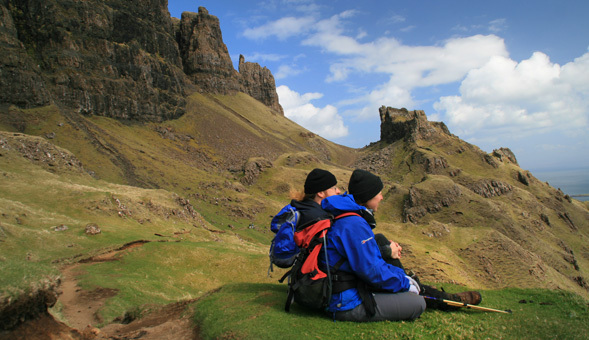 From the summit your views extend as far as St Kilda in the west and the Uists in the south. From Harris we will take the short ferry crossing to North Uist, here on the island's east coast lies the impressive and distinctive shape of Eaval. Most of North Uist is covered by water, from Eaval's summit you look down onto a maze of lochans that dominate the landscape and wonder how you made it across. On South Uist we walk around the pinnacles of jagged Beinn Mhor, at 620m the island's highest peak offering superlative views extending across to Skye. After your pick-up from Inverness Railway Station we will drive to Ullapool where you can spend the rest of the afternoon until we take the 19.00 ferry to Stornoway. The crossing takes 2.5 hours. The remote western corner of Lewis offers wonderful walking on these rough rocky hills. Griomaval is the westernmost hill in Lewis and has a wild “edge of the world” feel with views out to the Flannan Isles and the open Atlantic. We finish with a visit to the beautiful sandy cove of Traigh Mangurstadh. 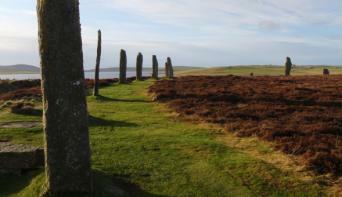 We visit the famous stone circle at Callanish on Lewis before climbing Toddun on Harris, poised above Loch Trollamarig. Although this is only a short climb, the way is steep, rocky and pathless; the view, however, more than rewards the effort. 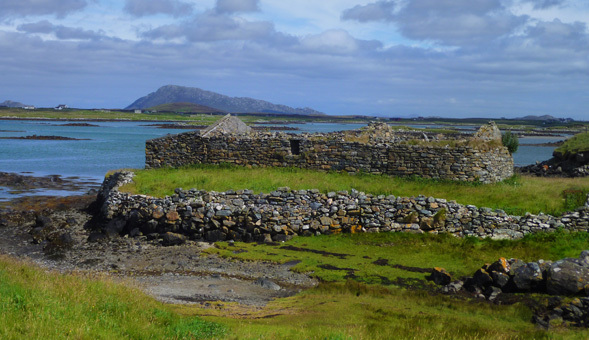 The deserted cottages on the lochshore provide a poignant reminder of the islands’ history. At 799 meters Clisham is the highest hill on the Outer Hebrides and provides a memorable day’s walk when combined with Mulla bho Dheas. On a clear day views from the summit extend as far as St Kilda in the west and the empty lands of Lewis to the north. In the morning we take the ferry across the Sound of Harris where Eaval’s distinctive shape is a constant drawn on the North Uist landscape. Our route weaves around a maze of lochans to reach the summit from where you get an almost aerial view of this amazing “waterscape”. At 620m Beinn Mhor is the highest hill on the Uists and showcases the drastic contrast between the remote and rocky east coast of the Hebrides and the long sweep of machair on the west. 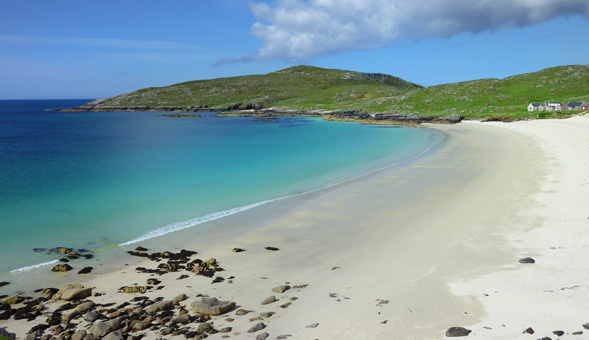 As an alternative, sometimes we explore the lovely island of Eriskay, scene of the incident made famous by the film “Whisky Galore”. After breakfast and a brief visit to the stone circle of Pobol Fionn and the Bronze Age cairn at Barpa Langass we will take the morning ferry to Skye and continue our journey to Inverness. On Lewis we will stay two nights in a quality, hand-picked guesthouse. On Harris we will stay two nights at the comfortable Harris Hotel. Finally we spend two nights on North Uist were we stay in the family run Templeview hotel or a comfortable guesthouse. Throughout your journey you can be sure of a friendly and warm welcome. "Wonderful location, smooth and seamless organisation. Iain is a passionately interested guide who clearly loves the place"
"It was one of the best holidays I've ever had. Well organised, brilliant guide and great company"